Mads Vassar Blog: Before "Poughkeepsie Shuttle" Was "Vassar Trolley"
Before "Poughkeepsie Shuttle" Was "Vassar Trolley"
Today's "Picture the Past" section in The Poughkeepsie Journal features the Vassar Trolley, an early predecessor to today's Poughkeepsie Shuttle. 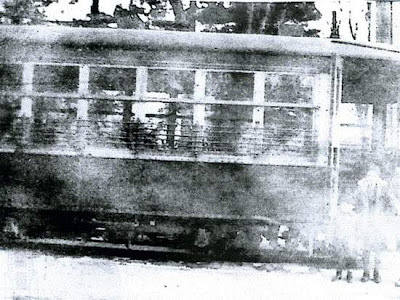 The trolley, depicted here on its last day of service in 1935, transported people from Vassar to Main Street down by the river. Awesome pic of yesterday's trolley. Most of them are still in commission and use. Check out the ones in San Francisco and Jacksonville.